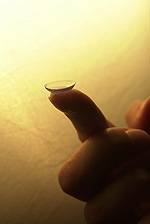 Looking for Contact Lenses in Burlington, ON? Visit Dr. Tracy Brodie and Associates in Burlington, ON for Next Prescription of Contact Lenses. At Dr. Tracy Brodie and Associates we offer a wide selection of contact lenses including disposable soft contact, bifocal/multifocal, toric, and colored lenses. Whether you wear daily, weekly or monthly disposables, or conventional (vial) lenses, check out our selection of lenses that fit your needs. Putting on a clean, sterile contact lens daily minimizes the risk for infection.